Samsung Chaton Download | Bada | Blackberry | iPhone | Android | Free Pc to Phone Calls, Free Voip Calls to India International ! Samsung Chaton messenger is in news these days. Many people have asked me to review Samsung Chaton Messenger highlighting its features. Well Samsung ChatON is a global mobile communication service that enables you to have better relationships with your buddies or groups of buddies. Samsung ChatON brings together all of the new methods of communication, expression, and sharing in one place. Samsung Chaton Messenger can be downloaded on multiple devices, its a multi platform application. I have tried Chaton messenger on my Android mobile and it works great. 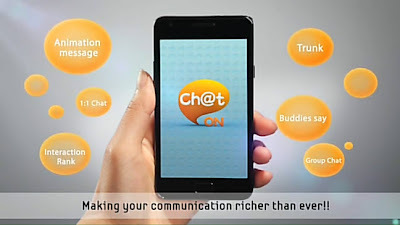 Smartphone application like Viber, Tango, Whatsapp and now ChatON have just taken over the mobile voip market! If you are having a smartphone and not using these voip apps then you are surely losing a lot. You should seriously consider using Samsung Chaton. Samsung Chaton is supported on all Android 2.2 Froyo and upper OS devices. (Galaxy S series, Galaxy Tab(7"), and other android phones etc.). Samsung Chaton Download for Blackberry : Please visit "www.chaton.com/download.html" on internet browser of Torch 9800 to download ChatON. Samsung Chaton is launched for Bada Mobiles as well. Samsung ChatOn Download for Bada : Download Link. 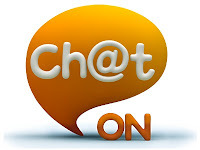 Connect with all friends having Chaton messenger installed. ChatON supports many platforms and devices. Users can chat freely through ChatON. Samsung ChatON multi platform app and multiple ways to communicate! Features : Chat, group chat, broadcasts, animation messages, pictures, videos, audio, location info, contacts, calendar. I really liked the feature of Animated messages, where you can create your custom messages. Check out the video tutorial on Samsung Chaton Messenger below. Its a nice video on various Samsung Chaton features. When you start ChatON for the very first time, you will be asked your name and phone number for registration. Enter your name and phone number in international format. e.g. for USA, use +1777222222. Once registered you can start ChatON by simply selecting the ChatON icon on your mobile or tablet. You are ready to chat with your buddies on ChatON. Group chat can be started by Selecting Group chat menu from buddy list or chat list. Select buddies to invite to group chat. Now you can enjoy chatting with a group of buddies. Or, you can start a group chat by inviting other buddies to an existing chat window. ChatON will use your internet data or Wi-Fi. There is no additional cost when you send or receive messages via Wi-Fi. If you are using Samsung Chaton on your mobile then please share your views in the comments section. If you are any doubts or concerns please share those as well, we will try to answer all your queries. Time to download ChatON! How long do we have to wait for the PC version?